About half the 100,000 people displaced amid a wave of atrocities in north-eastern Democratic Republic of Congo (DRC), where the Ugandan army is leading an operation against Lord’s Resistance Army (LRA) rebels, have no access to humanitarian assistance, according to the UN. “We estimate that half the displaced are beyond reach. There are no roads or airstrips. In some cases they are close to where the fighting is,” Idrissa Conteh, a spokesman for the UN Office for the Coordination of Humanitarian Affairs (OCHA), told IRIN in the north-eastern DRC town of Bunia. Conteh added that one of the largest concentrations of displaced people was in Doruma, close to the Sudanese border, with 14,000 people. “The situation there is catastrophic,” he said, listing some of the priority needs as food, non-food items and healthcare. In recently attacked areas, people tell us their first need is not so much food and non-food items but security,” said Conteh. When aid workers travelled to Duru, 90km north of Dungu, one of the main towns in Orientale, they found most of the population hiding in the bush. “When they saw the MONUC [UN Mission in DRC] vehicles and helicopter, they came out, but as soon as the helicopter left they went back into the bush,” said Conteh, adding that distributing aid in such a place would serve as a magnet for hungry rebels. On 13 January, some 70 tonnes of UN aid reached Dungu, after a 10-day road trip from Goma. In mid-December, with the explicit backing of the Security Council, the Ugandan army, with the DRC and Southern Sudan, launched Operation Lightning Thunder against LRA bases in Orientale. The military action followed the renewed failure of LRA leader Joseph Kony to sign an agreement to end his 20-year rebellion against the Ugandan government. 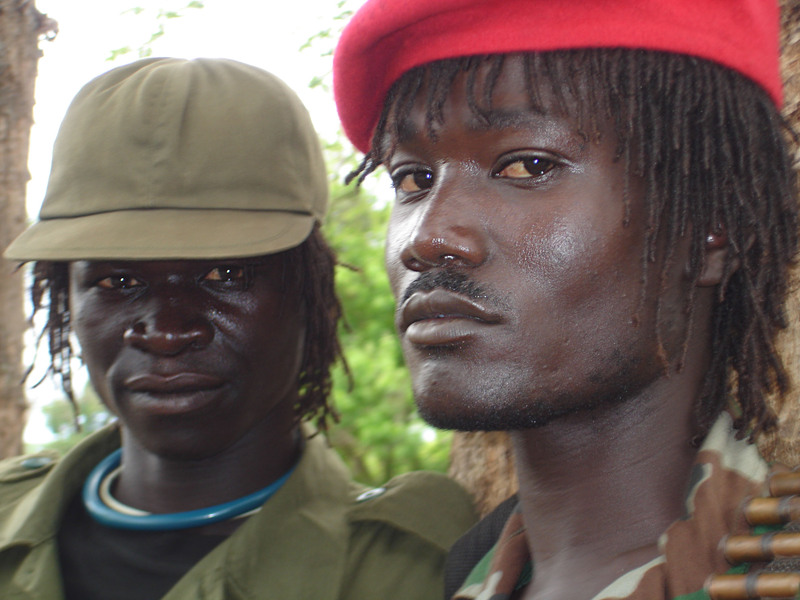 Two members of the LRA, Rikwangba, Sudan, April 2007. Since then the LRA has been blamed for the murder of hundreds of civilians. Uganda has also faced criticism over the operation. The Enough Project described it as “poorly executed” and “operationally flawed”, noting that “LRA camps were largely empty of fighters and high-level commanders when struck by Ugandan aircraft”. The advocacy group added that Lightning Thunder had made the situation in north-eastern DRC worse by playing to the strengths of the LRA, “who know the tricky terrain better than their adversaries … are able to move and disperse quickly in small numbers … have shown every willingness to loot and pillage to survive”. There appears to be no let-up in civilian deaths. In just one incident, local officials told IRIN 25 were killed on the night of 14 January in Dingbé, about 160km north of Dungu, close to the Sudanese border. Two days later, nine people were killed and hundreds of houses torched in two other villages in Orientale province. Dieudonné Rwabona, a district commissioner in Orientale, told IRIN: “The problem is that the Ugandans began bombing rebel positions before the [DRC army] could secure the areas” from fleeing LRA fighters. “We shall continue to pursue Kony and his fighters, but at the some time we are extending an olive branch to him, telling him to come back home. He should come and sign the agreement but if he continues being adamant we shall go full-blast and finish him off,” she warned.